As of last month (March 8th-ish, 2018), Let’s Encrypt supports wildcard certificates! This is great news, because it means that those of us who like using tons of subdomains can now get one cert for all our subdomains, rather than having to get a cert for every single subdomain. As you may know, Certbot is the tool provided by the EFF that you use to interact with and issue certs from Let’s Encrypt. It used to be called letsencrypt-auto, but when the EFF took it over, it switched names to Certbot. Now, it’s not quite as easy to get wildcard certs as it is to get normal certs – mainly because there are some prerequisites. The nice thing is, some of these prerequisites make it easier to issue and renew certificates without temporarily disabling your web server. Wildcard certificates are only available if you use the ‘DNS’ method of verification. 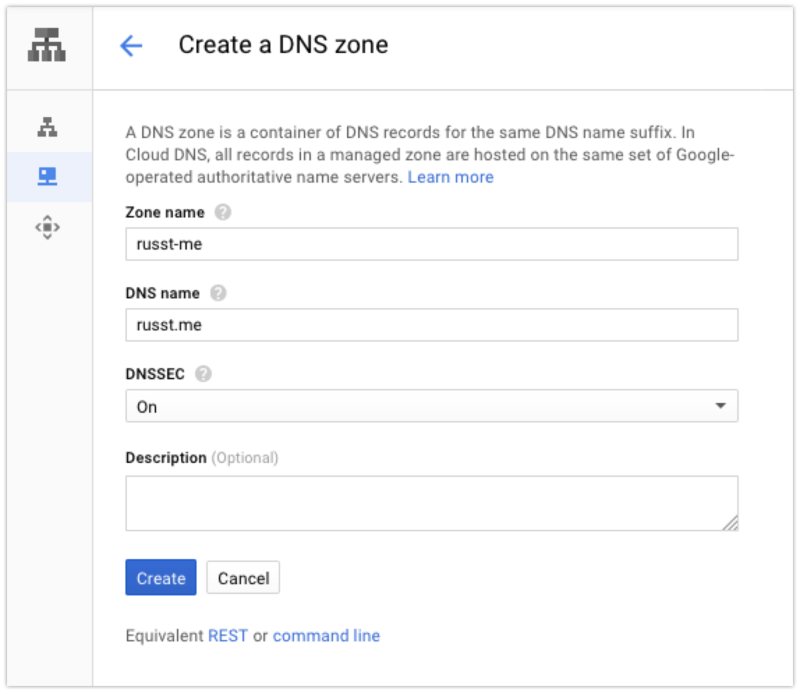 I’ve decided to just go with Google Cloud DNS, because I’m already doing some other stuff in Google Cloud Platform, and it’s really quite affordable for what I need. Sure, it’s not as cheap as just using the DNS that your registrar provides, but I know mine doesn’t provide an API, especially not one supported by certbot. 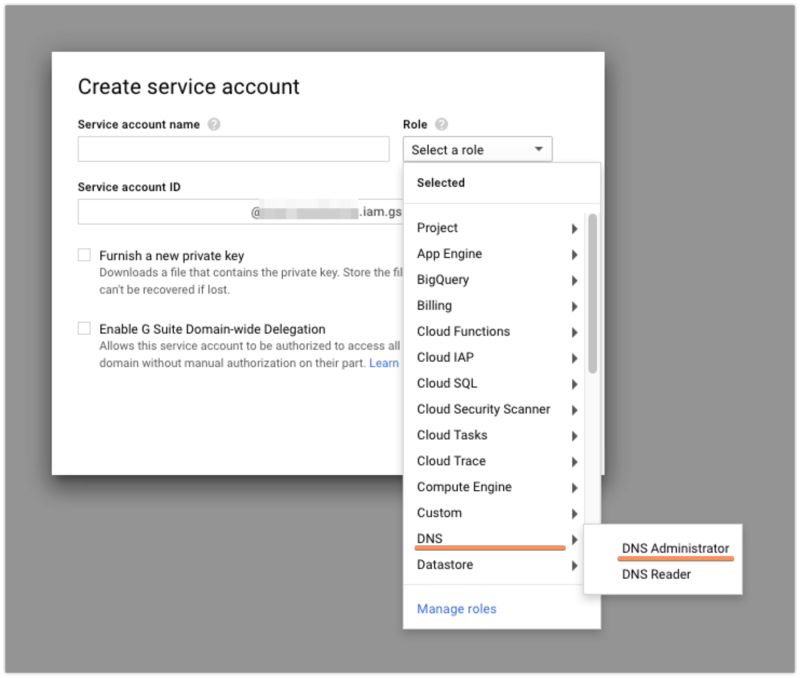 To get Google Cloud DNS set up, you’ll obviously need a Google account. 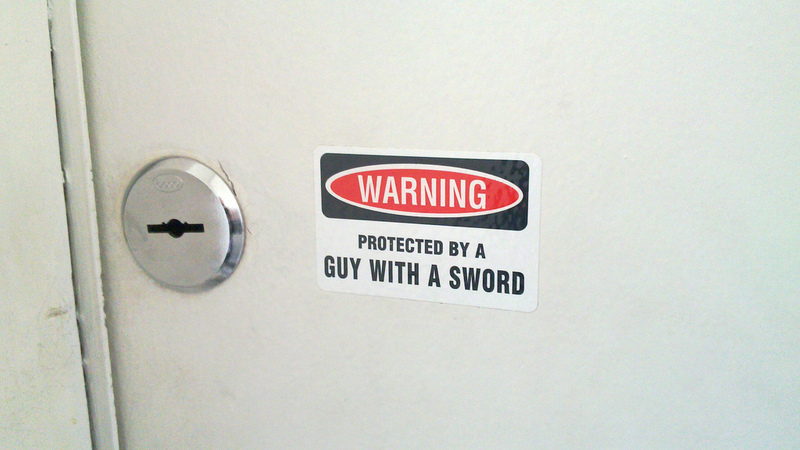 If you don’t have one, well, I’ll leave it to you to get one. Then you’ll need to set up Google Cloud Platform – once again, I’ll leave that to you. You’ll also need to set up a project for your DNS records. If you already have a project, you can feel free to use that. Once there, you’re going to want to click the ‘Create Service Account’ button at the top. Currently, the Cloud DNS permissions and whatnot are in beta, so that means that while you could﻿ create a custom role that would have exactly the permissions that you need, those are subject to change and there’s a decent chance that you’d need to recreate your service account later. To avoid this, I just made my new service account into a ‘DNS Administrator’. It’s got more permissions than I strictly need, but I’m not super﻿ worried about that. When you create your account, it should automatically download the JSON file with the credentials. I copied that key to the server I’m using to issue certificates (my good ‘ole Linode server!) so that I can use it later. Naturally, to do anything with DNS, you need to have a domain to do something with. 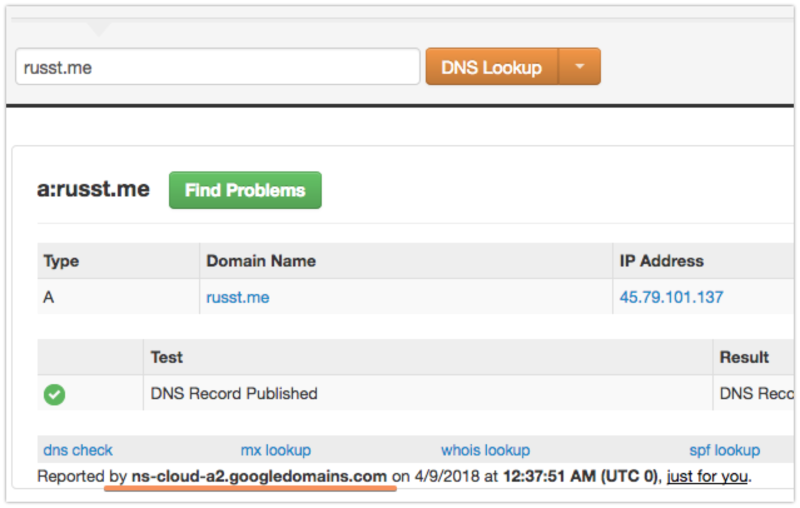 You’ll have to point your registrar to Google/your DNS provider of choice before you can actually issue a wildcard certificate. Then you’ll create some records for your domain. 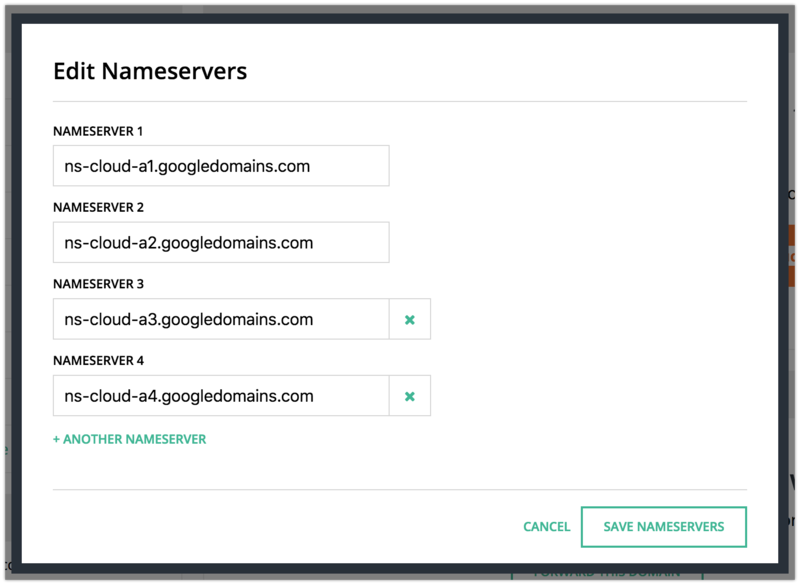 At the very least, you’ll probably want one A record pointing to your server, but you can also create subdomains or whatever else you want. If you’re copying your config from somewhere else, put in all the records that you had on your previous provider. I had quite a few records, but even so it didn’t take very long. Once that’s updated to your new provider, you’re ready to get issuing certificates! Now, we can do something really nifty here to renew our accounts. Instead of installing certbot-auto on our server, we can just always use the latest up-to-date version in a preconfigured, lightweight Docker container. Sure, this requires you having Docker installed, but who doesn’t these days? If you’d rather, you can do this all manually with your own certbot-auto installation, but I chose to go the Docker route, for simplicity’s sake. Now it’s actually pretty simple to just run our Docker container. We just need to get the correct arguments, and we’ll be good to go. Note, this does require that you have locations set up where you want to put your certificates, otherwise they’ll just float off into the ether when your container shuts down. So first up, let’s create the place we want our certificates to be placed. In my case, I’m going to stick with the default, since my server has already been storing Let’s Encrypt certificates there anyway: /etc/letsencrypt. This is where Let’s Encrypt stores all its configuration and certificates by default. If you’re putting it somewhere else, go ahead and create that directory. Keep note of it for later, naturally. Later, we’re going to map our Docker container to use that as a volume. Next up, we need to create the place where Let’s Encrypt will store backups. I guess this isn’t strictly necessary (mine is empty anyway), but I figure it can’t hurt. By default it’s in /var/lib/letsencrypt. So we’ll also be mounting that. 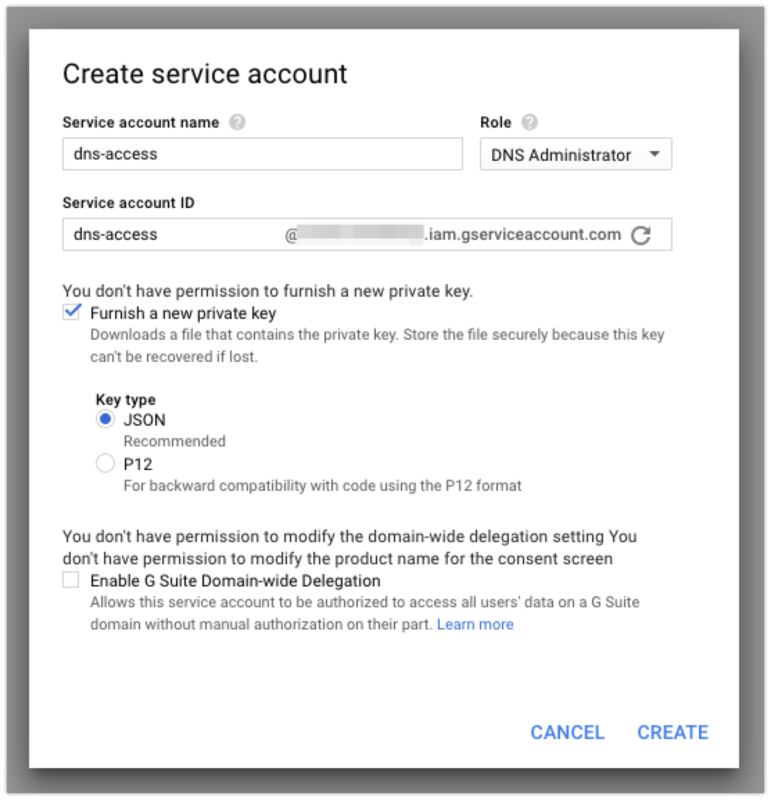 Finally, we need to mount the directory where you put your GCP service account’s credentials. I’ve put mine in ~/.secrets/certbot and changed the name to google.json, but you can put it wherever you want and call it whatever you want, really. The image that we’re going to be using (assuming you’re sticking with Google DNS) is certbot/dns-google. If you’re using another DNS provider, you can probably figure out pretty easily which image you’ll need. In the command itself, we’ll also need to use the certonly command, signifying to certbot that we don’t want to have it try to actually install the certificates for us, we only want it to issue them. I personally prefer installing them myself anyway, and that would be very difficult and/or impossible to do from within a Docker container anyway. We’re also telling certbot to use Google’s DNS with --dns-google, and we’re giving it the path to the credentials file with --dns-google-credentials <file-path>. The last thing we have to do is manually specify the Let’s Encrypt server that we’re using, because right now, wildcard certs are only supported by one server: --server https://acme-v02.api.letsencrypt.org/directory. That should do it for our arguments. Of course, if you’ve made any adjustments in the way you’re doing this, you’ll need to adjust the command itself. 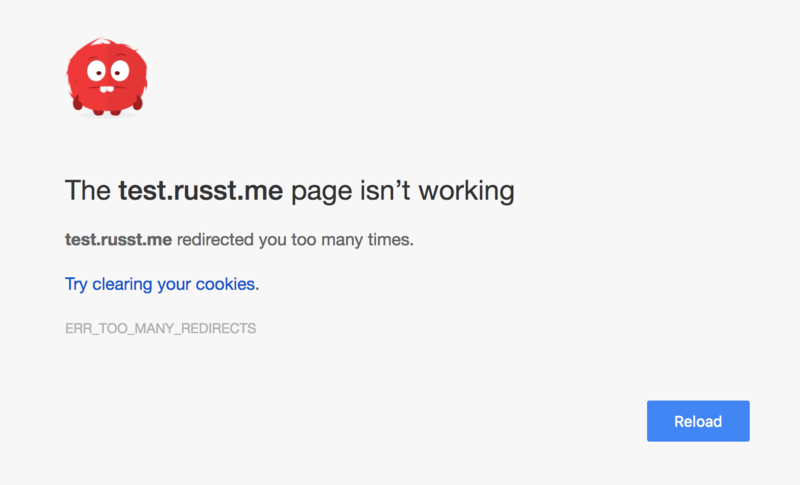 The final line is the important one, -d '*.russt.me, is telling certbot to issue a new wildcard certificate for *.russt.me. You’ll want to make sure you change it, because, well, I’d rather you not issue certificates for my domain. Plus, unless you’ve hacked my Google DNS account, you probably don’t have access. I’ve cleaned it up a bit, but that’s the gist. I chose to ignore the ‘Unsafe permissions’ warning, since I’m running this in a Docker container anyway and the file on my system actually does have the correct permissions. I’ll leave the configuration and use of these certificates up to you. Hopefully, you have some idea of how to use the certificates on your own server. If not, there are guides all over that should help you out. I’m extremely thankful to both the EFF and to Let’s Encrypt for enabling us all to issue free SSL certificates, and it’s even better now that they’re letting us issue wildcard certificates. If you’re also feeling thankful, head on over to the EFF’s donation page or Let’s Encrypt’s donation page and drop a donation for them. The web will thank you for it. If you’ve got any questions or comments, feel free to drop them in the comments below! I’ll do my best to get back to you. Extra props if you correct an error or tell me a better way to do this. Now for some explanation of what’s going on in that configuration file. First, we catch any unsecured traffic – that’s the directive that says listen 80. This part is just a temporary provision to allow us to accept both HTTP and HTTPS traffic while we’re getting things set up. Later on, we’ll adjust the config to redirect all the HTTP traffic to HTTPS, forcing secured connections. 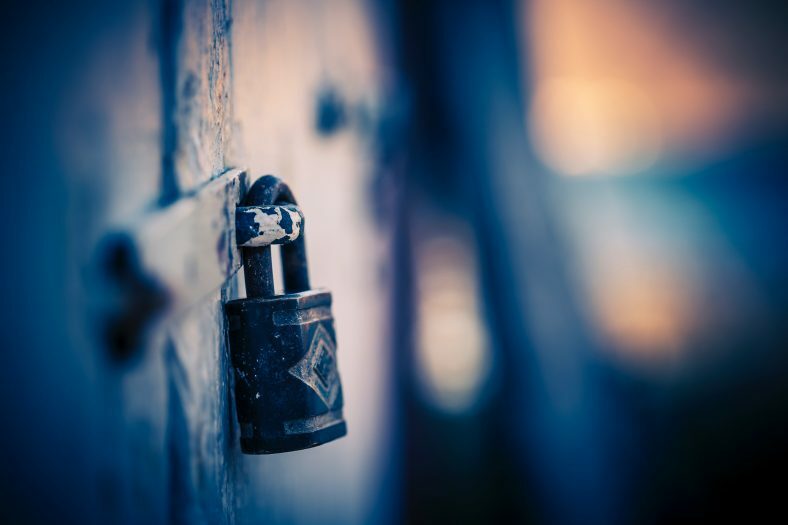 For now, though, you’ll notice that the first server block for http and the second server block for https contain large blocks that are identical – that’s because for now they do pretty much the same thing – just one with encryption and one without. In our second server block, we actually configure the stuff that matters. First, we enable ssl and tell nginx where to find the TLS certificates. Next, we configure the ciphers that we’ll allow on this site. These specific ciphers are recommended by Mozilla for ‘modern’ compatibility. If you need to support older stuff, you’ll have to investigate allowing less secure ciphers. After that, we have several location blocks that tell nginx what to do with different requests. The first and second rules tell nginx to check for a matching file (that’s the try_files). If it finds a file, like an image, CSS, JS, etc., nginx will serve that file directly. If there isn’t a matching file, it passes it to @apache, which is defined in the next rule. Nginx is faster at serving raw files than Apache, so we want it serving files where possible. The next two location rules tell nginx to pass any requests for .php files or requests ending in / to apache, as well. We pass these to apache because it’s faster at handling php requests. In these cases, I’ve got Apache running locally on port 8081. We need to forward the headers and request host to Apache to make sure that Apache still knows what to do to handle the requests properly. Finally, the last location rule tells nginx to deny access to any files beginning in ., which are hidden files that really shouldn’t be shown to the public. With a quick restart of nginx, your new configuration should take effect. Luckily, as far as configuration goes, nginx does most of the heavy lifting. It only forwards the appropriate requests to Apache, so our Apache configuration is pretty straightforward. Of course, the most important thing that you need to do is tell Apache to listen on a different port than nginx. By default, both nginx and Apache listen on port 80. I decided to tell Apache to listen on port 8081 by specifying that in my httpd.conf file – by changing the Listen line to Listen 8081. It’s a pretty simple configuration – just telling Apache what to listen to and where to find the applicable files. And that does it for our web server configuration! Finally, we just need to tell WordPress that it needs to just use https. 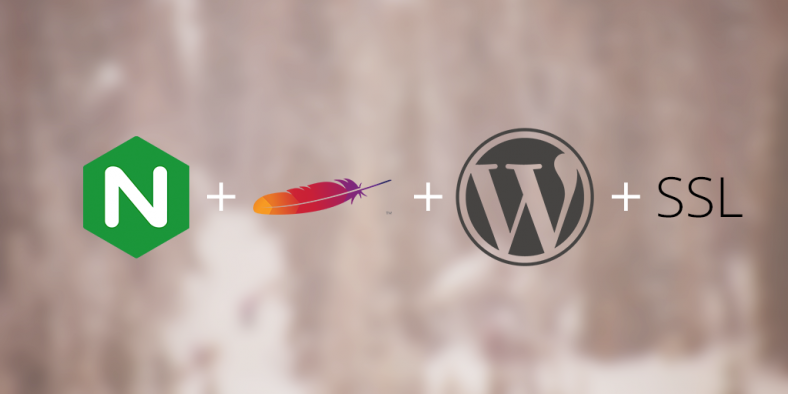 You see, the primary difficulty with the WordPress portion of things lies in the fact that WordPress normally assumes it’s running on Apache, with no proxy set up. But since you’ve got your web servers configured to temporarily allow http, this is a pretty easy fix. First, log in to your control panel. There, you’re going to need to access ‘Settings ▶ General’. Finally, update both your ‘WordPress Address’ and ‘Site Address’ to use https instead of http. These lines tell WordPress that we want to use the control panel over HTTPS. If we leave these out, we end up in the endless redirect loop I mentioned up above. Now, you’re ready to force all your traffic to use HTTPS. All this does is return a 301 Status Code, telling users’ browsers that an address has moved permanently – all major browsers will automatically redirect them to the exact same address, but using https instead. It’s a simple way to force traffic to use https. 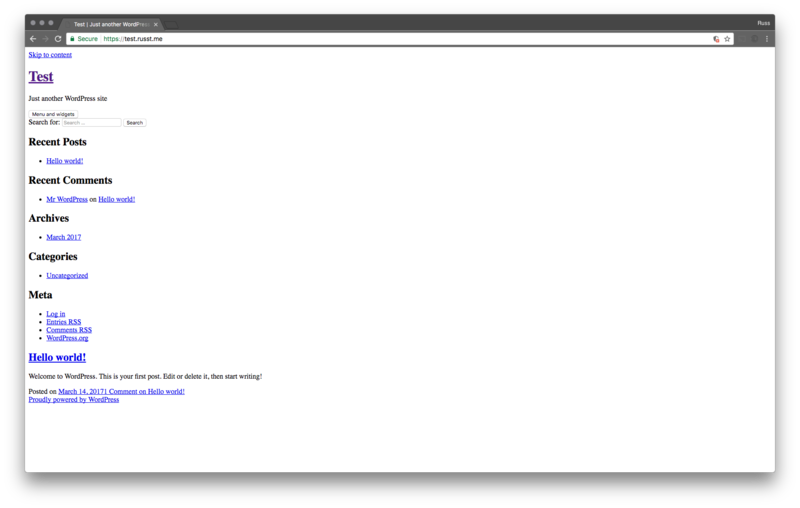 With one final restart of nginx, you’re good to go! All your wordpress traffic will be set up to use https.